Industry news + tips to help you take the best care of your garments. Care Labels: Are they really important? Ever wonder what those little symbols on the care labels of your clothing mean? Are they really important? The short answer is: yes! Clothing manufacturers are required by the Federal Trade Commission (FTC) to attach a label to each garment, providing a safe method of care. Professionals in the dry cleaning business [like those at Heider Cleaners] rely on these symbols to determine the best possible way to clean your garments. They are required for all fabric articles with the exception of suede, leather, hats, gloves, socks, footwear, reversible garments and household items such as draperies, linens, and upholstered furniture. DRY CLEAN: Any dry cleaning process that may include moisture, pressing by Steam or steam-air procedures with drying up to 160°. It is sometimes shown by the letter “A”, “P” or “F” to indicate the solvent type. DO NOT DRYCLEAN: Potential hazards exist if garment is submerged in dry cleaning solvent. HANDWASH: Gentle soak with light agitation by hand. This symbol is sometimes accompanied by one, two or three dots, indicating suggested water temperature. One dot = cold, two dots = warm, three dots = hot. MACHINE WASH: A commercial or home washer is acceptable. This symbol indicates “normal” washing instructions. A symbol with a line underneath indicates “permanent press” and one with two lines indicates “delicate” or “gentle” wash. Wash temperatures are again indicated by the number of dots within the machine wash symbol. One dot = cold, two dots = warm, three dots = hot. BLEACH: Indicates that bleach can be used on a washable garment. The symbol with an “X” through it would indicate “NO BLEACH”. The symbol with diagonal hash lines inside indicates “NON-CHLORINE BLEACH ONLY”. IRON: It is recommended that the garment be ironed. Temperature settings indicated by the number of dots, One dot = cold, two dots = warm, three dots = hot. 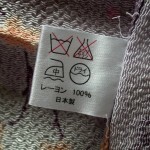 The symbol with an “X” through it would indicate, “DO NOT IRON”. Of course, if you do think about using a professional dry cleaner, you should always #ThinkHeider. *These Symbols are used by the American Care Symbol System and are intended to aid and instruct in the laundering process. Certain knowledge and skill level may be required to properly clean some garments.